Over the next two weeks, FishDuck.com Feature Writer Caleb Couturie will be analyzing the remaining 25 teams in the NFL Draft that may look to select Marcus Mariota. 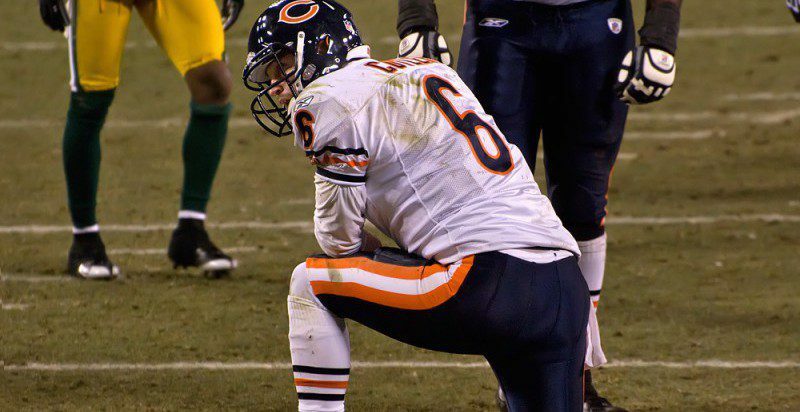 After 2014, Jay Cutler might have just leaped the Cubs for most disappointing season in Chicago sports. What makes Cutler so different, and consequently impossible to deal with, is that he might just be the most physically gifted QB in the entire league. He has one of the greatest arms the league has ever seen, he can throw the ball 1000 miles per hour, and he’s got great touch. It all sounds perfect, right? Wrong. He’s inconsistent (28 TDs, 27 TOs), his footwork is still sloppy even after nine years in the league, and Oh! Right! He always looks like someone just kicked his puppy. You can’t be the leader of a team when you absolutely refuse to show any signs of passion. Drew Brees, Aaron Rodgers, Peyton Manning… the list goes on. Those guys get fired up! They lead their teams in the huddles and they slap their linemen on the back of their heads if they mess up. They care, but it’s clear Cutler just doesn’t. Chicago trades Cutler, 2015 first-round pick, and 2016 first-round pick to Tampa Bay for the No. 1 pick and 2015 third-round pick. I initially drew this up with Tampa just giving up the No. 1 pick, but that’s not totally fair. What is important, though, is that Tampa would have to take on Cutler’s massive, and I mean Jupiter-sized, contract. Chicago somehow got it in their minds that Cutler deserved to be one of the highest paid QBs in the league, and while Tampa has the cap space to afford him, they certainly won’t be eager to pick that deal up. However, receiving a first-rounder from the Bears in 2016 is tempting, and coach Lovie Smith knows just as much as anyone else how Cutler operates. Smith could work with Cutler again, and with the weapons down in Tampa he could maybe (finally!) get Cutler to perform to his potential. Getting someone such as Cutler, who no matter what is still a Top 10 QB in the league and a way better option than Mike Glennon, would be an opportunity Tampa would have to take. As for Chicago, a team already floundering, they’d get a chance to hit the reset button. They’re absolutely rolling in potential, but Cutler could only get them to a 5-11 record. Now although some of that was due to an absolutely dreadful defense, it didn’t help that Cutler had a TD-to-TO ratio of almost one. There’s too much talent, especially on offense, for the front office to watch Chicago finish last in the NFC North again. This is like a slightly different version of Mariota landing in Philly, honestly. Chicago has to be one of, if not the, most loaded teams in terms of skill player talent. Brandon Marshall and Alshon Jeffrey are two of the Top 10 wideouts in the game, and Martellus Bennett is right behind Gronk and Jimmy Graham in terms of top tight ends. Matt Forte is debatably the best all round RB in the NFL, and even his backup Ka’Deem Carey shows tremendous upside. In short, the Bears have talent pouring out of their ears. Every year experts predict that they’ll make the playoffs, and then Cutler “Cutlers” it up and the Bears end up in third (or worse) place in their division. The Bears should absolutely be in the playoff hunt this year, and really every year with an offense as talented as what they have. Mariota would certainly make rookie mistakes, but with the ability to rely on Forte to carry a lot of the workload he shouldn’t feel too pressured. Also, Jeffrey, Marshall, and Bennett are pretty great security blankets for a first-year QB. Well it sure as heck won’t be Jimmy Clausen.